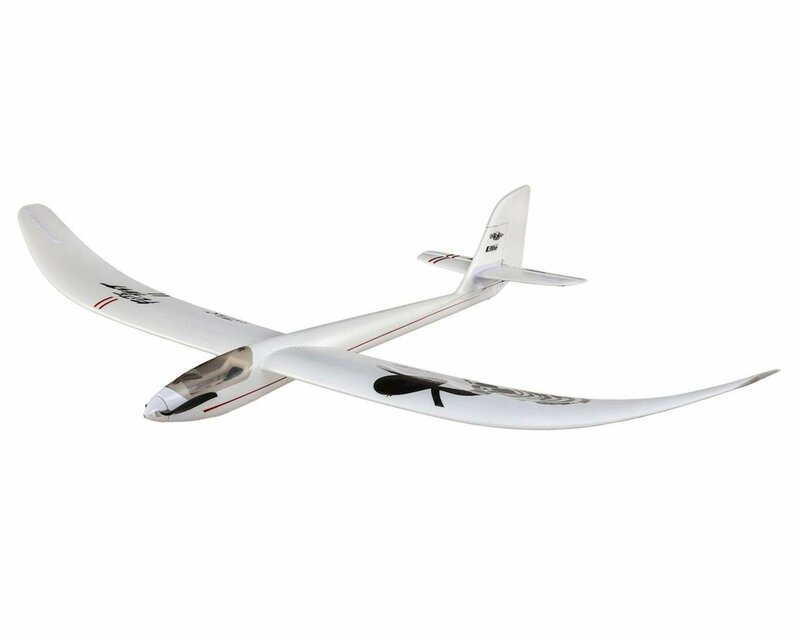 E-flite Radian® motor gliders are legendary because they capture the essence of pure and modern soaring styles in aircraft that are as much fun to sport fly as they are to soar. Inspired and approved by the Flite Test (FT) crew, the Night Radian FT improves the popular 2-meter version with multiple upgrades including a programmable LED light system that allows you to fly all day and night. The horizontal tail is now fully-molded. 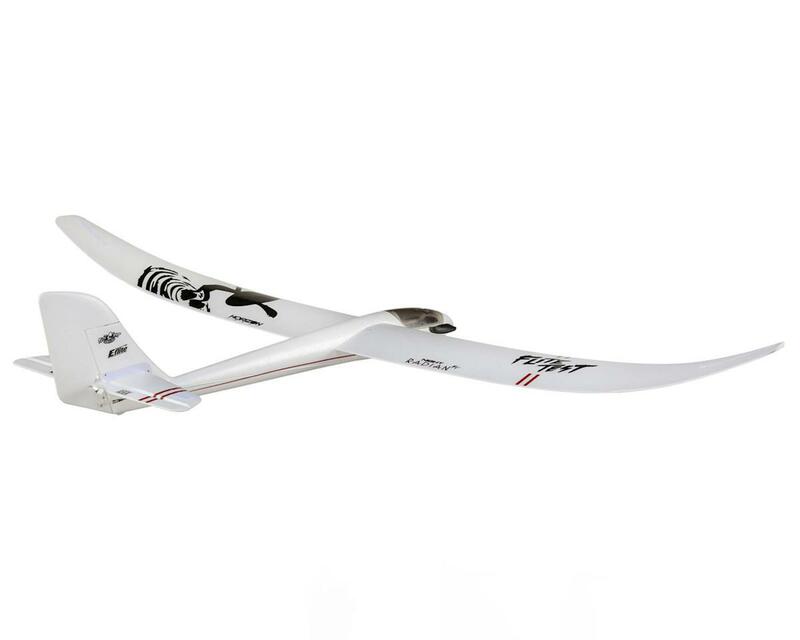 Plus, the BNF® Basic version features AS3X® technology to deliver smoother flight performance in windy and high lift conditions while optional-use SAFE® Select technology makes this Radian airplane even easier to fly than it already is. 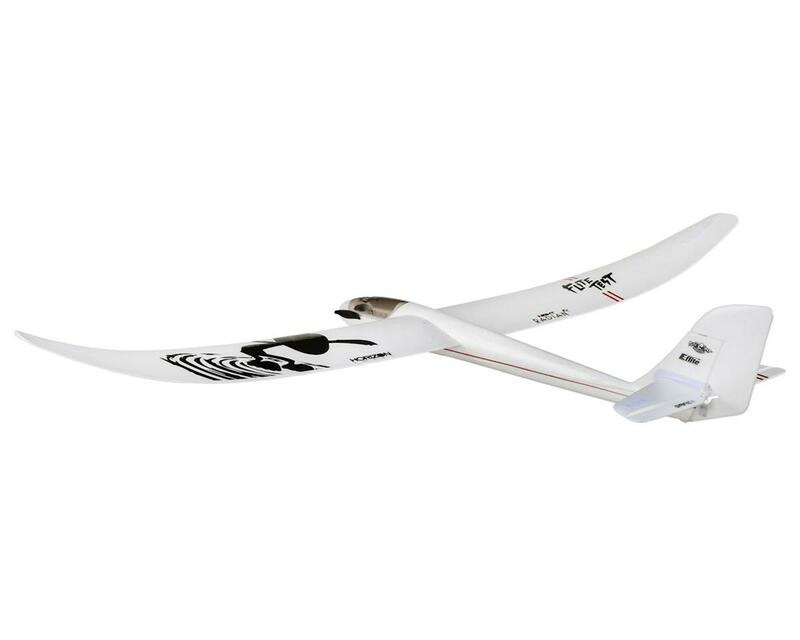 The E-flite Night Radian® FT 2.0m motor glider combines the serenity of soaring with sport flying and incredible night flying capabilities. Factory-installed, high-visibly LED lights are recessed throughout the airframe, including in the redesigned airfoil-shaped horizontal tail. The vivid colors and placement of the LEDs offers incredible visibility and easy orientation when flying at dusk and even in complete darkness—or they can be turned off when flying in daylight. Even more impressive is that the LEDs can be programmed to display 100+ different color, sequence and timing combinations by utilizing the built-in controller. Multiple Night Radians flying together in the dark can be easily distinct. Best of all, even with the addition of lights, the durable, composite reinforced EPO construction has been kept as light as possible so there’s no discernable difference in flight performance or thermal soaring capability. 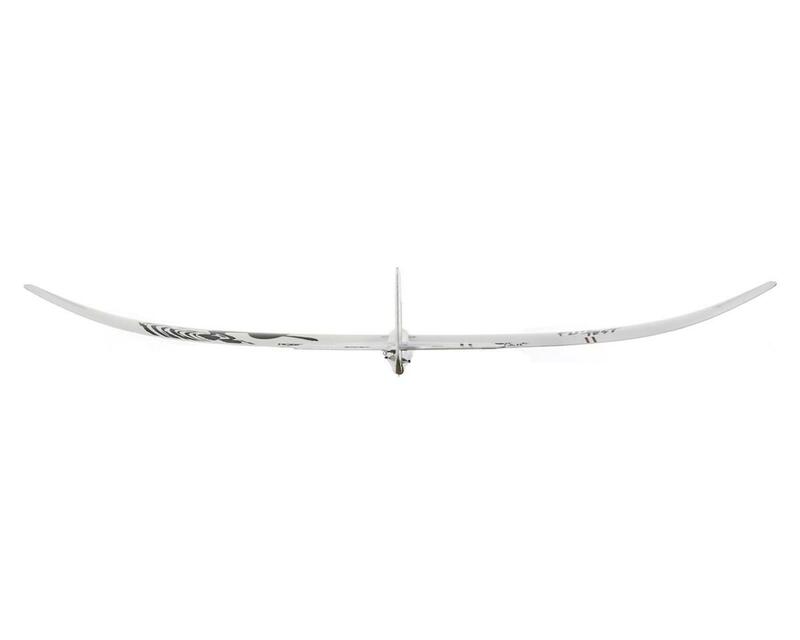 The distinctive and gracefully curved polyhedral wing and efficient airfoil delivers outstanding soaring performance and long flight times with or without the use of power. And, there’s no Hi-start or cumbersome launch system to worry about. The high-power brushless motor and folding prop combination provide outstanding efficiency so you can enjoy soaring and sport flying in the same flight, plus the ability to climb and find thermals multiple times between battery changes. Integrated LED Lighting: Embedded into the airframe is a factory-installed LED light system that practically provides even better orientation than when flying in daylight. Multi-colored light strings operate through a built-in controller that offers 100+ different color, sequence and timing combinations, and are conveniently powered by a 3S 1350-2200mAh flight battery. You can even use the onboard switch to turn them off when flying in daylight. Flite Test Approved: The original Radian® 2-meter motor glider was already popular in the Flite Test community, so E-flite and the Flite Test crew partnered together on the Night Radian FT to finalize its unique capabilities and appearance–including the exclusive, Flight Test-designed trim scheme. The result is a more versatile aircraft that almost any RC pilot can appreciate and enjoy flying. 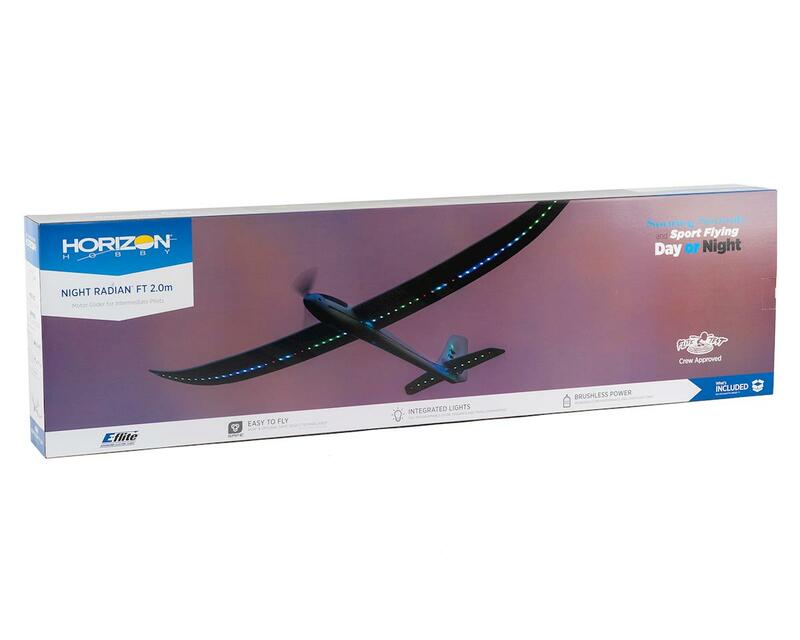 Lightweight & Tough: The redesigned horizontal stabilizer is fully-molded to feature an airfoil shaped cross-section and integrated LED lighting. 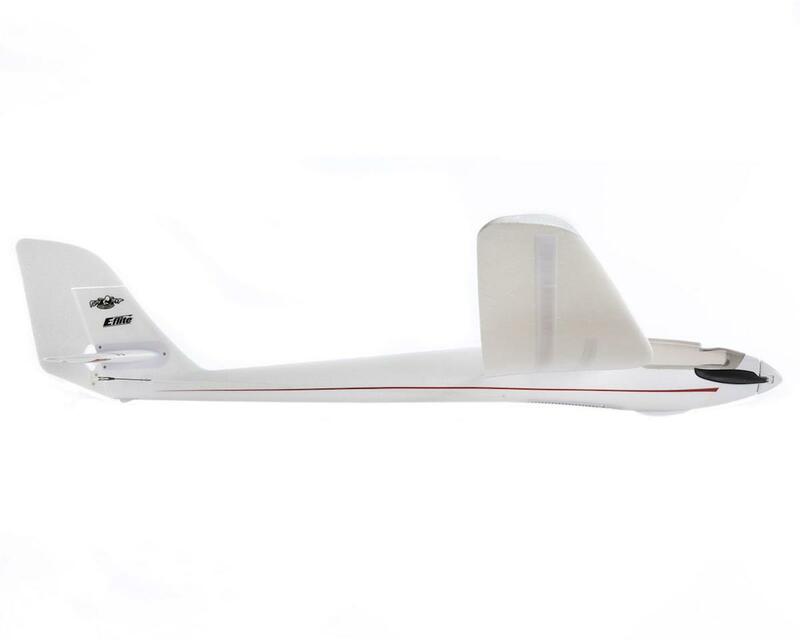 Construction with composite reinforced, molded EPO material delivers a lightweight yet durable airframe that delivers a unique airplane that’s easy to maintain and offers the best flight experience possible. Brushless Power: The efficient, factory-installed power system features a 30A ESC with brake, a powerful brushless outrunner motor and a folding two-blade propeller that delivers incredible climb performance and long flight times on everything from a compact 3S 1350mAh up to a 3S 2200mAh LiPo battery. 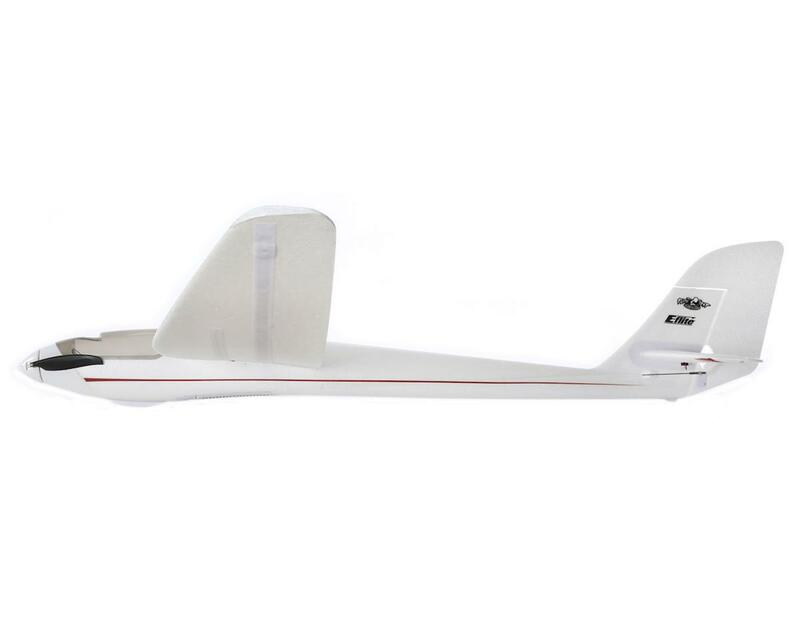 Easy Assembly: No glue is required for final assembly and the Night Radian FT motor glider can be ready to fly in less time than it takes to charge a battery. The two-piece, bolt-on wing featuring a carbon-fiber wing tube makes field assembly/disassembly, plus transportation and storage, easy and convenient. This is a great plane to go out and relax with. Nice and large for visibility during the day and night and of course the light are cool, but they also help a lot with orientation during the dusk timeframe before it gets dark. My daughter loves to watch this swoop overhead, lighting up the entire ground around her. I can turn the motor off and glide past and actually have a lot of control over it at low speeds with the motor off as well. It is more agile than I thought it would be for not having ailerons and having those giant polyhedral wings. If you don't have a radian already, get this one. If you already have a radian you can find some good kits online that people have made that allow you to control lights like this on your own radian. love flying my plane I bought from amain. having trouble with the lites on the night radian glider. the 1 800 number not good. Could you give me your local number. I have this one and it's great. Don't need the AS3X. I put my own receiver in and it flies good without the AS3X. Looks great at night with all the light patterns. Had to glue the tail on because is was a little loose. Other than that great. Today I maidened my night radian. It was absolutely awesome to fly at night! It is a very stable platform and I was impressed that it even can go "fast". It is for sure not an acrobatic plane, but it is still very capable of doing close maneuvers and that without ailerons. battery recommendation is defenitely 1300mah 3s, 2200mah 3s mah is the maximum which fits just in. Awesome! The original Radian was WAY BETTER than the Radian Pro. Now the original Radian with lights... I'm in!! I thought I was buying an updated Radian Pro. Instead I got a dumbed down version. It has no ailerons and no flaps. I also noted they made the battery holder smaller. On the box it says “for medium flyer”. Are you serious! My first trainer had only elevator and rudder like this plane. Without flaps I don’t consider it a glider. So buy it for the night light but not as a glider.